Recent torrent rainfall and soaring temperature had slashed my farm block seriously. 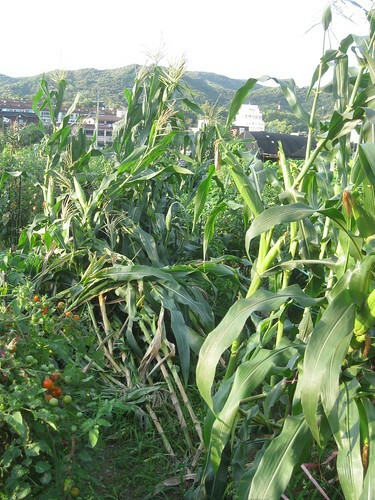 Wet ground could not sustain maize to fall down over hot pepper and tomato section. Their growth is now in stuck. 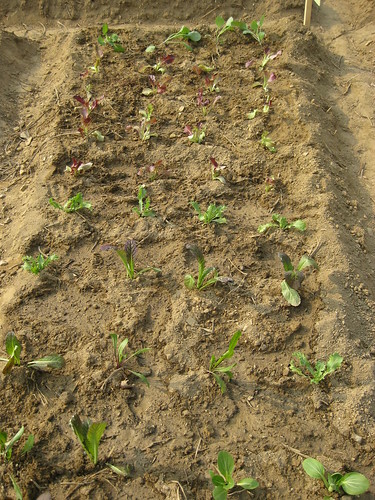 Repetition of rain and sunshine led excessive growth of lettuce varieties making them inedible. 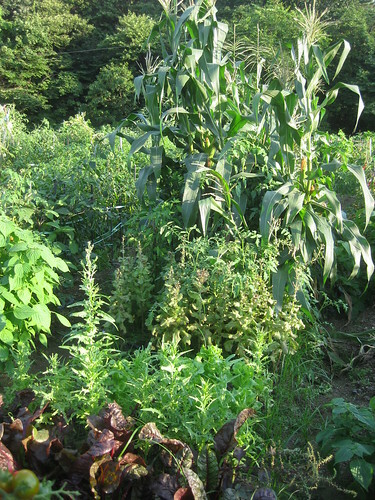 I spent last weekend in erecting maize stems, fixing sustaining poles for tomato and hot pepper, and eradicating overgrown lettuce. 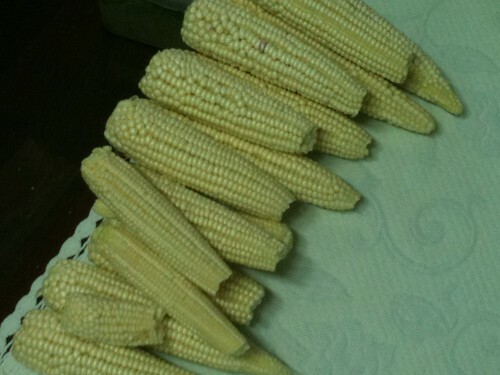 I could get considerable amount of maize crops while cutting off broken maize stems. Hot peppers and tomatoes seemed to need more time to get ripe. Another month will make the remaining ready for harvest by a rule of thumb. 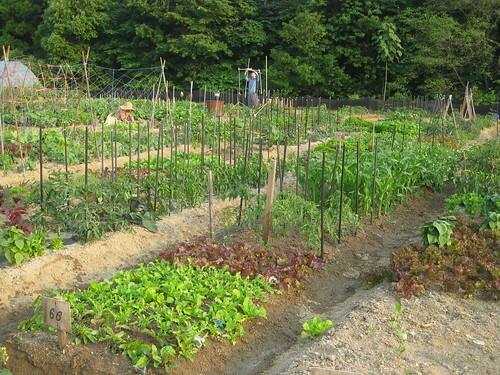 In a month, I will be completely re-plowing my block for autumn vegetables such as cabbage, radish, and so forth. The first half of farming season is nearly at an end this moment. The yield was not so bad in comparison with that during the first half of the last year. However, last year's experience in farming did not help much toward higher yield rate, I think. Knowledge from experience is one thing and doing what I know is totally another. Simply speaking, this circumstance came from lack of patience and diligence! 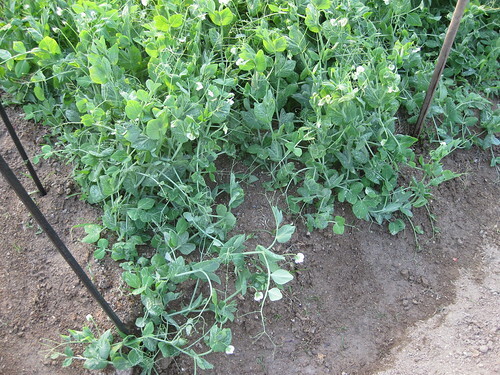 Green peas are creeping over the ground! 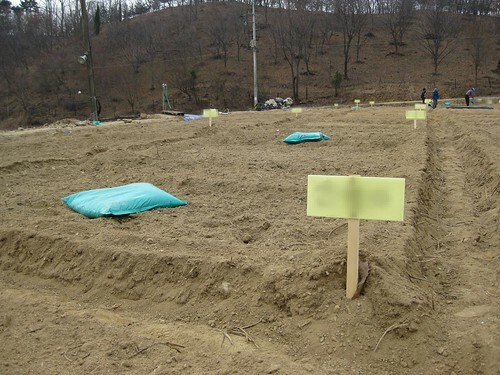 This is attributed to a lazy farmer, Hyok Kim. :-D Anomaly in climate does not make sense any more. Erecting them with strings across stakes should be the highest priority task upon the next visit. I spent more than half an hour in watering my block. It looks like a farm at last. Last year's great experience from weekend family farm led me to another challenge right after move-out to new home. Beginning March, I went around so many places to locate the best family farm nearby new house. I paid yearly rental for a farm block out of five candidates April. This post is a story from "getting started" to "up-to-date" development. This year's land space is bigger by 1.5 times than previous one at SanBon. Per-square rental fee is higher approximately by 1.5 times, too. Land shape is long bar type whereas last year's was nearly square. One of the lessons learnt last year is that I have to focus on manageable number of varieties on a farm block. Planting, eradicating in case of failure, and their repetition over so many varieties took so much amount of time seriously. Another lesson is that lettuce yield resulted in oversupply for my family. With these two key experiences, I partitioned the farm block roughly into four pieces; green pea block (30%), maize block (30%), tomato/chilly block (25%), and lettuce block (15%). 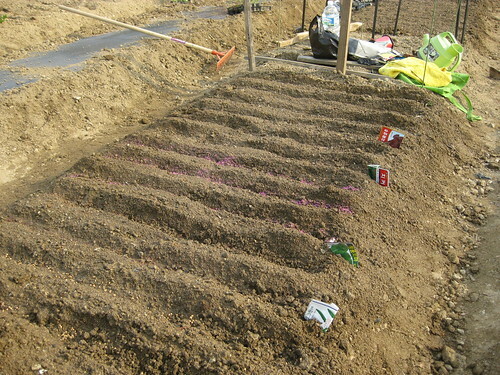 Then, stake planting followed. As of today, all blocks are going well without any risky symptom yet because most of environmental conditions seem to be identical to or better than those last year; easy access to water supply, no need to shape farm block itself (initial plowing done by landlord), no need to mix fertilizer (done by landlord, too), and so on. 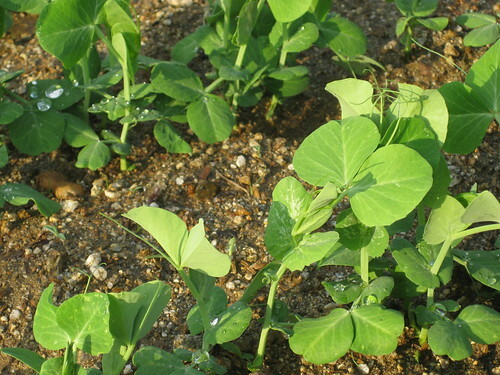 However, one unforeseen circumstance may impact on crop yield as well as the success of this year's farming in the long run. That is anomaly in Korea's climate. I never experienced such terrible weathers during this season since my birth; harsh up-and-down in temperature, high wind, lack of sunshine, and so forth. Weather forecast confirms such kind of anomalies all through this year. Weekend family farm played best role as a gathering point among friends as well as family members so far. Cultivation efforts strengthened friendship and kinship with collaboration. 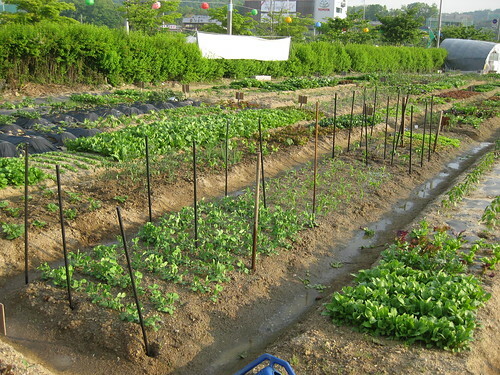 Seeding and transplanting, after all, produced kinds of vegetables for daily consumption. I don't need to include the names of vegetables in my shopping list accordingly. We intended chemical-free farming at the beginning. It seemed that we would abide by that rule until the end farming cycle (late fall) because we did not feed anything except water. Last visit got us shocked, however. 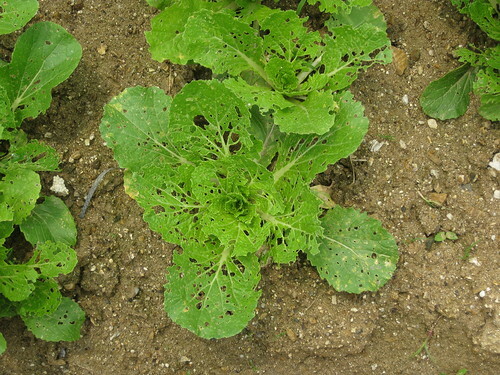 The farm land was covered by endemic diseases and bugs as shown below. Some block damaged seriously whereas others got slightly. It's clear that we have two options; 1. Applying insecticide 2. Leaving them as a part of nature. We came to a conclusion that you will not apply chemicals as possible. 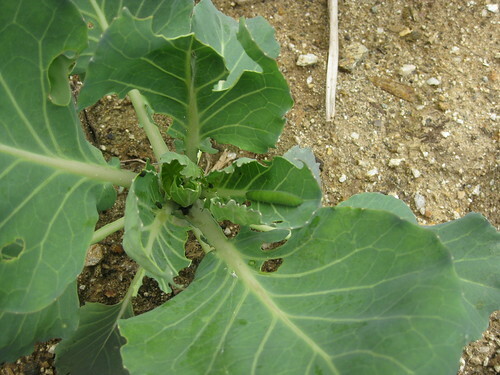 One strategic alternative for leaf vegetables is to harvest them when they become big sprouts (not when they get fully grown) to minimize possibility of exposure to bugs and diseases. Nothing yet determined for root vegetables of (sweet) potato, bean (victim of wild animals) and maize (smelling yummy for crows)! Give me some idea not to pollute environment and not to harm human at the same time! 참살이 바람을 타고 주말 농장이 인기다. 집안의 숙원 사업 중 하나이기도 해서 2009년 4월 4일 드디어 5평 넓이의 주말 농장을 시작했다. 첫 삽을 뜬 이후 한 달 정도 지났다. 그간 일어난 왕초보 농사꾼의 좌충우돌 경작기와 느낌을 정리했다. 멋모르고 시작한 초짜의 심정이라고 보면 된다. 주말 농장을 할까 말까 고민하는 있는 "초짜" 에게 도움이 되었으면 한다. 유기농이 가능하다? 유기농의 기준을 어디에 두느냐에 따라 달라지겠지만, 무농약과 무약품 등의 관점에서 보자면 주말 농장은 이 같은 환상과 거리가 먼 것 같다. 정말로 순수한 유기농을 실현하는 주말 농장도 있을 것이다. 그렇지만, 대부분 비료 농약 없이 무엇을 재배한다는 것은 불가능해 보인다. 다만, 대규모 상업적 농업과 비교해 상대적으로 농약 비료를 "덜" 사용한다는 것을 유기농으로 볼 수도 있을 것이다. 사 먹는 것보다 싸다? 비싸면 비쌌지 절대 싸지 않을 것 같다. 주말 농장에서 (주로 밭농사다.) 재배하는 것은 주로 (쌈) 채소류와 구황 작물이다. 이들의 연간 재배 비용을 최소 기준으로 계산해보자. 농장 연간 임대료 5만 원 지급했다. 5평 기준으로 싼 편이다. 첫날, 퇴비로 1만 원 지급했다. 종자 비용으로 1만 원 정도 들었다. 종자 1봉이 평균 2,000원 안팎이다. 모종 형태로 (어느 정도 자란 작물을 사서 옮겨심기) 재배하기 시작하면 돈이 감당 안 된다. 여기까지만 해도 7만 원이다. 봄에 심거나 뿌린 작물이 죽지 않았을 때 얘기다. 교통비, 시간/노력비용, 농약 값 등도 제외했다. 각자 이런저런 비용 나름대로 고려해보자. 사 먹는 것보다 쌀 수가 없을 것이다. 그럼에도, 왜? 한 달 동안 삽질의 연속이었다. 물 주는 시기를 놓쳐 (정말 일주일에 한 번 갔더니만 ㅋㅋ) 씨가 다 죽어 밭 일부를 갈아엎었다. 모종을 사다 심었는데 다음날 비바람이 몰아쳐 몇몇이 꺾어져 죽었다. (이후 지지대를 세워 하나씩 고정했다.) 실패에 대한 무력감과 예상치 않은 추가되는 비용 때문에 스트레스 점점 쌓여간다. 그렇다면, 왜 주말 농장을 하는가? 주말 농장과 농사짓는 일은 가족 간 화목과 단합을 이끌어 내는 힘을 가지고 있다. 풍작이라는 공통 관심사를 향해 온 가족이 연중 자연스럽게 협업하는 형국을 갖추게 된다. 유아나 아동에게는 체험 학습의 장을 제공한다. 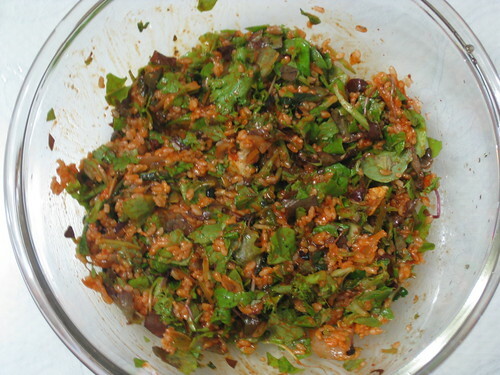 매주 소풍 가는 듯한 느낌이 든다. 겁 없이 달려들어 무지 고생하고 있다. 혹시 내년도에 주말 농장 계획 중인 분들은 위 내용 다시 음미하시라. 이미 발 들여 놓은 나는 어쩔 수 없이 올해 가을까지 쭈~~~욱 가야 한다. 아~ 삽질이여.